Imagine a tightly packed bar filled with folks dressed up in random brewery apparel, many with foreheads alight in smartphone glare. Last night was like that, and for a person who makes a hobby of drinking beer and then writing about it in the fading light of isolation, congregating with unfamiliar colleagues is a rush. A beer blogger conference is like a month of geek packed into a two-day squeeze. Part class with A-list professors, part schmooze-fest, part field trip, Beer Bloggers Conference ’13 in Boston has so far been welcome social outing after years of solitary sip-and-write. It actually helped that I got to Boston Park Plaza Hotel – a big, high-class joint in the center of the city – late, thanks to poor GPS input. By arriving 90 minutes into the event, I missed the “trade show,” which was just a bunch of brewer reps hawking their wares. 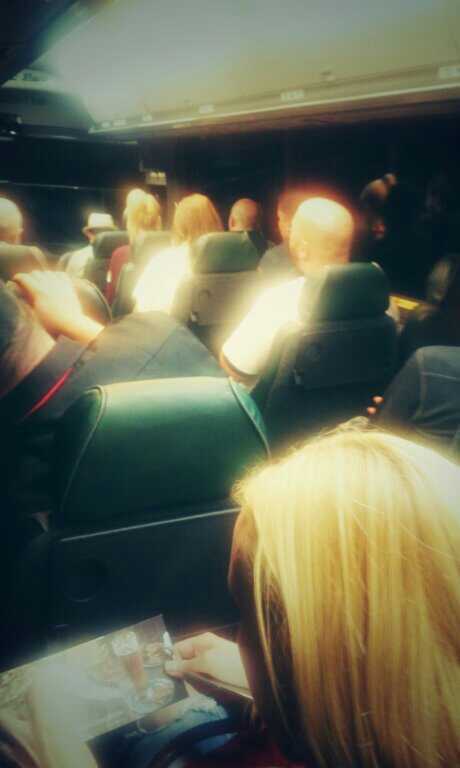 A few minutes later, with an ID wrapped around my neck I was on a Peter Pan bus. The whale rocketed us through some tight streets to Jamaica Bay, home of Boston Beer Company. They make a little beer called Sam Adams. And so there we were, at least a hundred of us, seated in folding chairs with a can of Samuel Adams Lager for each of us. A representative of The Brewers Association, Julia Herz, gave us some inspirational quotes that boiled down to, “Craft beer continues to be a growing force in U.S. society and YOU have a role to play in its success!” She gave some apt advice: if you want to be considered journalists, check your facts. 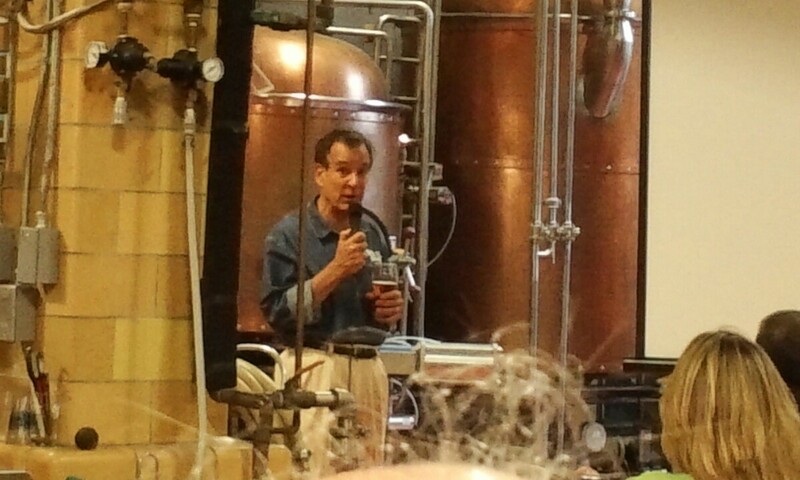 When Jim Koch – the face of craft brewing for more than 20 years – held aloft a pint of Sam Adams lager and addressed the crowd, there was something positively iconic about it. Not to gush, but I will: Jim Koch was a thrill to listen to. He took us through some history of the brewery (did you know that he originally had to pay off a neighborhood gang with free beer? Neither did I). After an intimate half an hour with Koch in the barrel room, learning about how vinegar sweetens to help create the Utopia strong ale that he passed around in healthy sip amounts, we had a chance to mingle in two rooms and eat pulled pork sandwiches, lightly breaded fish, and delicate vegetable rolls. I met the head of an up-and-coming brewery, several independent bloggers like me, and a representative from Brooklyn Brewing. Oddly enough, there were reps from Anheuser Busch and Heineken (Krysten). And they were HUMAN and COOL! After an aborted bottle share arrangement (instead of having a rager in my tiny hotel room, I ended up chatting with a single blogger from Florida), I got to sleep at 2. It’s 9 now and I’m ready to get into the meat of the conference. We’re talking presentations about the state and purpose of blogging, and live blogging practice with real, live brewery interviewees.